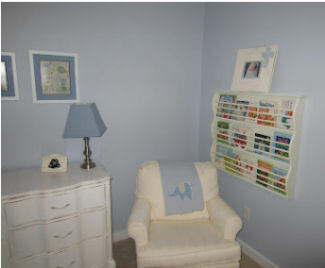 Owen's baby blue nursery is so precious that it made me stop a minute to wonder why anyone would ever want to decorate a baby boy's room in any colors other than light blue and white. Variety is the spice of life but the nursery that Kristen and Eric have designed for their soon to be born baby boy demonstrates why this traditional color scheme is a classic. 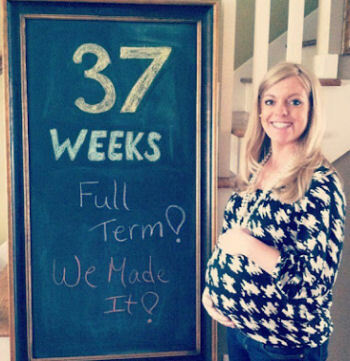 I love how she has included a blackboard in each photo where she has written how far along she was at the time the picture was taken, how big the baby was as well as special holiday greetings. Owen will treasure these precious gifts when he is all grown up. I would like to mention a wonderful book that Kristen recommended on her blog, "Prayers for Expectant Mothers: Celebrating the Miracle of Life". The excerpt that she posted was so moving, that I called a friend who is having a difficult pregnancy and read it to her over the phone and will be ordering a copy to mail to her as a pre-baby shower gift. I am so happy that she let us know about this wonderful book, now back to her baby boy nursery pictures! The fitted crib sheet features a similar shade of blue as the color that was used for the nursery walls. 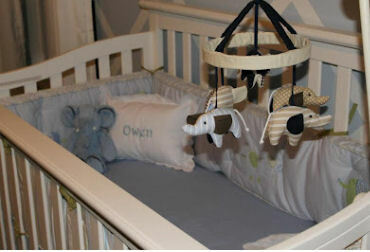 Owen's personalized pillow, his elephant baby mobile and bumper also have touches of blue. A large, toy giraffe seems to be keeping watch over the crib with a stuffed elephant at his feet. 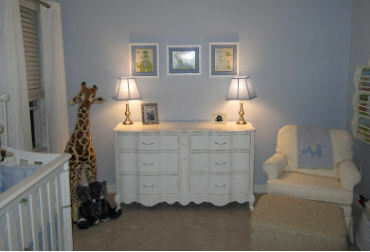 More cute elephants are on display in the framed artwork over the baby's dresser. 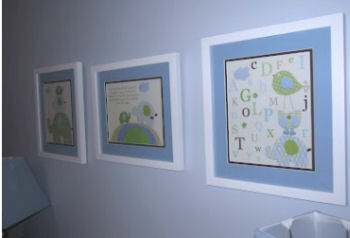 The prints bring a touch of spring green into Owen's baby blue nursery. There will be a verse on the wall over the baby's changing table very soon. 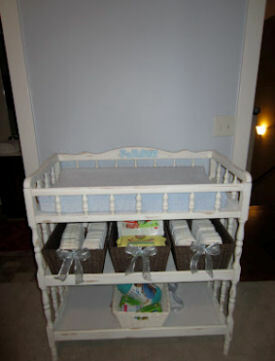 The storage baskets on the shelves underneath the changing area are filled with diapers and daily essentials. The reading area is ready and waiting with an ample supply of books and a very attractive, comfortable chair and ottoman. The pretty covers of the books add lively pops of color to this corner of the baby's room. More of Kristen's pregnancy pictures are posted on her blog, Baby Makes Three located at www.kristenandericpardue.blogspot.com/. Thanks for joining us on Owen's baby blue nursery tour. I'm sure Unique Baby Ideas' have enjoyed seeing Kristen's project as much as I have and will stop by her blog to leave a compliment on a job well done! I really wanted to change the current theme of my son's nursery and was browsing through the picture gallery when I found Owen's room which is SO beautiful. Can you please tell me the name of the paint color (as the other poster also requested) and the brand as the colors that I have sampled do not come close. What color paint was used on the walls? I love this room. What a lucky little boy!!! Kristen is a part of my family and I couldn't be more proud. This is a blessed for her and her husband, Eric. Their nursery is just a peek into how wonderful Owen's life will be. The nursery is so calm and precious just like Mommy and Daddy. This little guy is so blessed as are his parents. Love you lots and good job on the nursry for your pride and joy! I love this nursery. It is so incredibly sweet and looks like such a comfortable place for Owen to rest and play. Very welcoming! I'm sure the baby boy will be even more beautiful than his nursery. I love that it looks like a little boy's room, but still has an element of sweetness to it. They are only small for so long. Congratulations Kristen! Can't wait for pics of baby Owen! 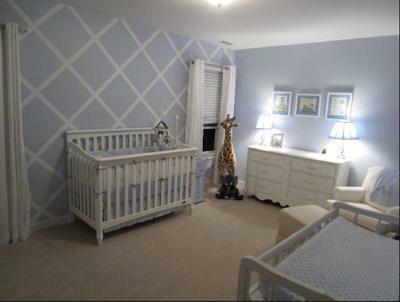 Kristen, I love how you brought this blue nursery theme together for Owen. I'm excited that I can see it since I'm in Virginia and you're in Tennessee. Thanking the Lord for bringing your pregnancy to full term and looking forward to seeing Owen in his crib. Perfect nursery for a baby boy! Beautiful room! Thank you for the prayer book recommendation. What a peaceful room! Love it!